BFC Partners’ Empire Outlets will be an approximately 340,000 square foot retail complex, comprised of 100 designer outlet retailers and a variety of restaurants and cafes. BFC Partners will also build a 1,250-space structured parking garage below the retail component to accommodate commuters and tourists alike. Designed by SHoP Architects, Empire Outlets will feature expansive open corridors to the water, contemporary materials reflective of the industrial waterfront, and a sweeping sustainable green roof visible from the harbor. Celebratory vertical circulation elements such as grand staircases, elevators, and streamlined escalators will guide shoppers as they move from the waterfront up to Richmond Terrace, creating a dynamic and easily navigated pedestrian experience. For more information about Empire Outlets New York City, please visit www.empireoutletsnyc.com. Find us on Twitter @EmpireOutlets and Instagram at @empireoutlets. 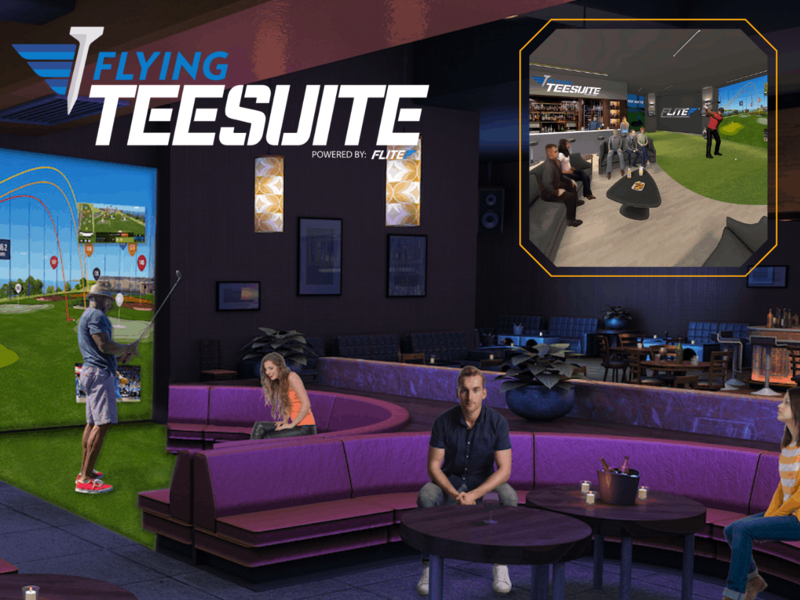 The TEE SUITE, powered by FLITE, brings the best of FlyingTee’s brand of active-sports-entertainment fun, with no skills required to the indoors. With a simplified touchscreen interface, the power of the TEE SUITE is ready to go for players age 8 to 98, with games and activities that level the playing field. New players and touring pros alike can use the Suite to play a championship golf course and enjoy the “perfect weather” year-round, by bringing golf indoors through the FLITE technology powering TEE SUITE and FlyingTee. Each TEE SUITE also offers a state-of-the-art way to play and enjoy the big game, concert, movie or any other televised event side-by-side with your friends, families, colleagues or coach! Luxuriously outfitted, the TEE SUITE feels more like a modern Vegas ultra-lounge than a place to get your swing on. For more information about the TEE SUITE, please visit https://flite.golf/ or www.flyingteegolf.com. Find us on Facebook @FlyingTee, Twitter @FlyingTee and Instagram @flyingtee.